ODOT sign honoring Officers Morelli, Joering on I-270. 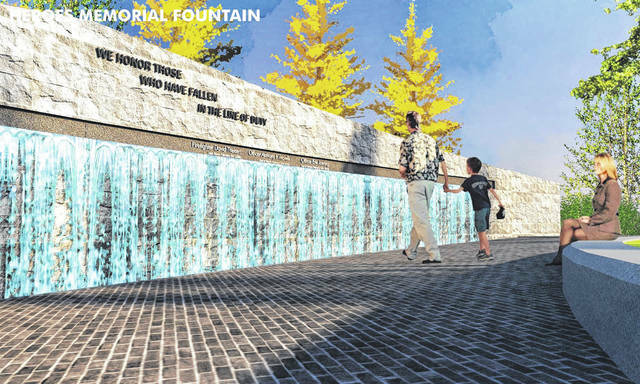 A conceptual drawing shows a fountain as part of the First Responders Park expansion in Westerville. The memories of Officers Morelli and Joering will not be forgotten. First Responders Park, adjacent to Fire Station 111, is being expanded to honor all who protect, serve and sacrifice. The names of our fallen first responders will appear on the Heroes Memorial Fountain at the park. Designs for First Responders Park have been approved and construction will soon be underway, scheduled for completion by September 11, 2019 in time for the annual 9/11 Memorial Observance. The state of Ohio generously donated $500,000 for the project which helped jump start the expansion plans for First Responders Park. However, additional funds are necessary to complete the park updates. On Feb. 10, 2018, Westerville Division of Police officers Anthony Morelli and Eric Joering were killed in the line of duty. As the community worked to cope with this tragic loss, plans to create a permanent police memorial were expedited. The state of Ohio generously donated $500,000 for the project. The following represents plans to upgrade a park that honors all first responders and to create a lasting memorial space for our local fallen who made the ultimate sacrifice. These concepts were created with a committee including the Westerville Chiefs of Police and Fire, as well as other representatives from the City’s police, fire, communications and administrative divisions. This park will help us remember and honor Westerville’s First Responders. Respect this ground, made sacred through their love, sacrifice and tragic loss. Recognize the endurance of those who survived, the courage and spirit of those who risked their lives to save others and the compassion of those who support us in our darkest hours. Expansion plans for First Responders Park (FRP) have been approved and will soon be underway, scheduled for completion by September 11, 2019 in time for the annual 9/11 Memorial Observance. 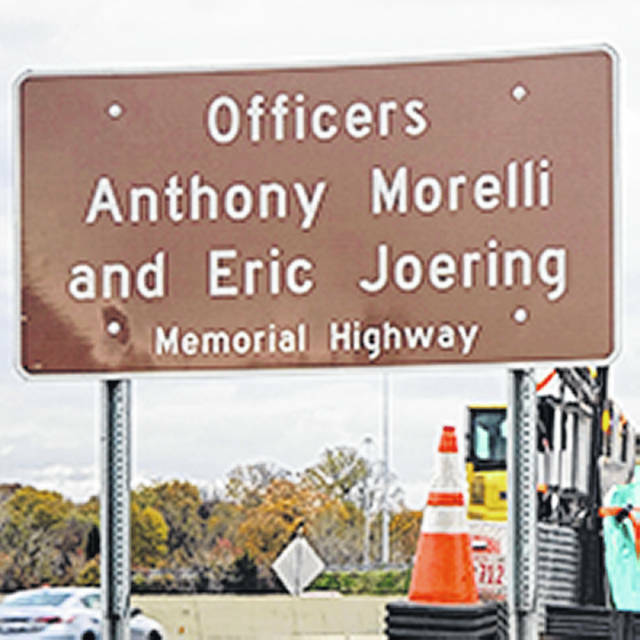 https://www.sunburynews.com/wp-content/uploads/sites/48/2019/01/web1_sign-for-fallen-officers.jpgODOT sign honoring Officers Morelli, Joering on I-270. https://www.sunburynews.com/wp-content/uploads/sites/48/2019/01/web1_fountain.jpgA conceptual drawing shows a fountain as part of the First Responders Park expansion in Westerville.